We will be sitting on the home team side as far left as possible. Afterward, head to Bolts Sports Cafe for drinks on the patio! Meet at door #1 (facing National Rd), tour starts promptly at 10 am. Doors will lock once everyone is inside. Afterward, meet at Marion's for lunch! 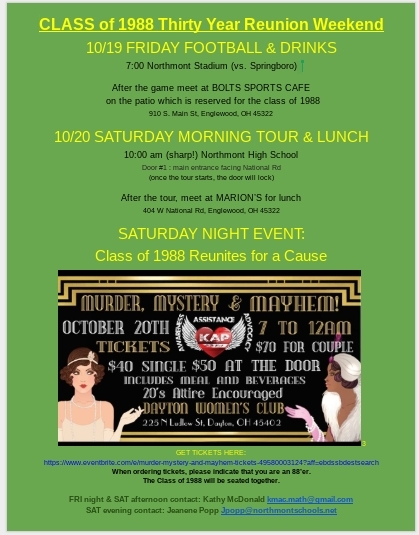 Class of 1988 THIRTY YEAR REUNION Class of'88 Reunites for a cause: Murder, Mystery, and Mayhem! 20's attire is strongly encouraged! AlumniClass.com (690) - 10019 E Knox Ave, Spokane Valley WA, 99206.